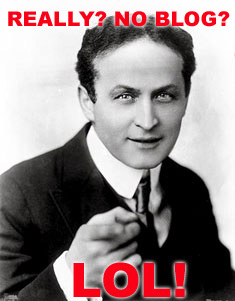 Houdini says we need a magic blog. eMagic Supply started out as a spin-off of Steve Fearson's Download Magic. While Download Magic featured only Fearson's own tricks, eMagic Supply carried a small number of downloads from other creators. Most notably Paul Vigil's Diplopia, which became a smash hit. Through the years we have grown and evolved, adding more magic tricks and supplies until we arrived where we are now. A one-stop magic shop with a strong focus on the art of levitation and levitation supplies including Steve Fearson's Vectra™ line of invisible thread and wax products. We now offer one of the most comprehensive lines of levitation magic and supplies in the business. If you want to learn to perform thread magic, this is the magic shop you're looking for. What we've never had is a magic blog. And we're told we're supposed to so here it is. We do have things to share from time to time that don't merit an email. Magic on TV that we think deserves a mention for instance. Being involved in magic as a business, we also run across some of the funniest magic videos and posts on magic forums, we may as well share them here where other magicians can appreciate them. And of course we're eager to introduce magicians around the world to our exciting line of levitation products. So if this will help more people find us and our magic, we'll give it a shot!